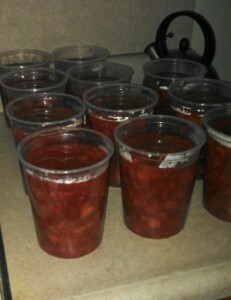 Lovina’s strawberry pie filling, ready for the freezer. It is a quiet morning at 5:30 a.m. Our two oldest daughters, Elizabeth, 20, and Susan, 18, just left for the factory a few minutes ago. All is quiet with the six other children still asleep. My husband, Joe, left for work before 4:00 a.m. and is probably hard at work already. They start working by 5:00 a.m. at the RV factory where he has worked for the last 9½ years. My dad was always an early riser and loved the early morning hours. He never liked going to bed late. There is so much beauty and peace in the morning hours. Yesterday we made 12 quarts of strawberry pie filling. We put it in the freezer instead of cold-packing it in jars. The strawberries came from my sister Emma’s strawberry patch. So many people are having a good supply of strawberries this year. The rains seem to be frequent enough. Our garden is doing so well already. But when everything grows, so do the weeds. It is so hard to keep up with them. Son Benjamin took the tiller through the rows of sweet corn, and that looks so much better. He also used the weed-eater to trim the weeds around the buildings that we can’t get with the lawn mower. That looks better too. It is just hard to believe Benjamin has grown so tall and can handle all these jobs. I think he is taller than I am. Benjamin’s school days are in the past now. He finished with eighth grade, which is usually the last grade the Amish children take. Benjamin was four years old when we moved to Michigan from Indiana. He was always full of energy and gave us quite a few scares during his younger years. Daughter Loretta was born 11½ months after Benjamin, and those two were quite the team when they were toddlers. Before Loretta could walk, I would put her in the playpen if I had to leave the room for a little bit. One time when I came back, I was surprised to see Loretta crawling around on the floor. Benjamin had managed to find my scissors and cut a hole in the playpen so Loretta could get out to play with him! I am so thankful neither of them was hurt. Needless to say, we needed a new playpen. Joe and the boys are fishing every chance they get. For Father’s Day the children gave Joe a tripod that has a chain to hang a kettle on. 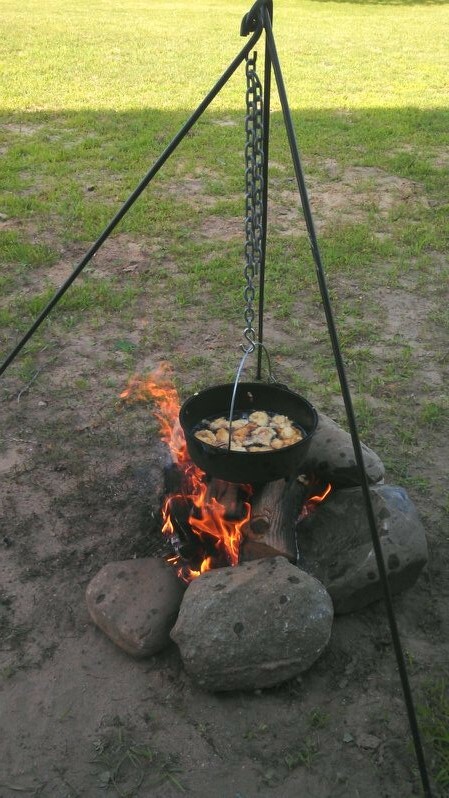 They also gave him a cast-iron outdoor kettle. Joe deep-fried fish in it one evening. It worked really well. Joe enjoys cooking outdoors and I have no objections when he offers to cook. The tripod and kettle that the children gave to Joe for Father’s Day. I’ll share my strawberry pie filling recipe with you readers. God bless you all! Put 6 quarts water in a 12-quart kettle and bring to a boil. In bowl, mix Perma Flo and 4 cups cold water. (Perma Flo is available at some Amish-run stores and online, but Clearjel can be substituted. Perma Flo works better for freezing.) Stir into boiling water, stirring constantly. After it thickens, remove from heat and add sugar, gelatin and salt. Add strawberries and stir until mixed well. Freeze in containers. This also works well as an ice-cream topping and in puddings or cobblers. Blueberry variation: Replace strawberries with same amount of blueberries; add 1 teaspoon lemon juice; replace strawberry gelatin with raspberry and blueberry gelatin (in equal amounts); and use 3½ cups Perma Flo. Peach variation: Replace strawberries with 7–8 quarts sliced peaches and replace strawberry gelatin with peach and orange gelatin (in equal amounts). Cherry variation: Replace strawberries with 10 pounds cherries; use 3½ cups Perma Flo; and add 1 teaspoon almond flavoring.